Because of their vital importance to the island’s ecosystem, several research projects have been conducted to better understand their habitat needs and requirements. In collaboration with the University of Georgia School of Forest Resources, the Town of Kiawah Island funded a it’s first detailed study of bobcat ecology in 2000-2001. The project was titled simply, The Bobcat Ecology Study. 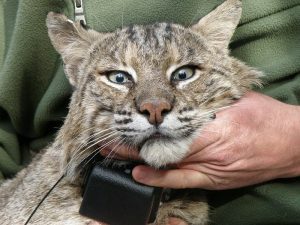 Fourteen bobcats were fitted with radio-collars, allowing researchers to track their movements. Data gathered from this project provided useful information on bobcat habitat use, reproductive success, home range size, food habits, and response to development. The Bobcat Ecology Study showed that Kiawah had a healthy, stable population of bobcats. The data also indicated that bobcats inhabiting the more-developed west end of Kiawah had larger home ranges than those on the less-developed east end, possibly indicating that denser development on the west end was forcing bobcats to travel greater distances to find the necessities of life (food, cover, water). In 2002, the Town of Kiawah Island and the University of Georgia initiated a project to investigate deer fawn mortality on the island. Data collected on this project showed that bobcat predation on deer fawns is the major force controlling Kiawah’s deer population. The Town of Kiawah Island, Kiawah Conservancy, and UGA initiated a new collaborative research project in 2004 entitled the Predator-Prey Ecology Study. Researchers fitted 16 bobcats with radio-collars and replicated the home range and habitat work conducted during the 2000 Bobcat Ecology Study. Data collected indicated that bobcats are continuing to adapt very well to continued residential and resort development. In 2006, The Town of Kiawah Island, in partnership with the Kiawah Conservancy, began a new Bobcat GPS study. In early 2007, biologists fitted 5 bobcats with GPS collars to investigate the effectiveness of these collars in tracking very fine-scale movements of bobcats. The collars performed very well and large amount of useful location data was collected. Based on the successful results of the pilot year of this study, it was continued in 2008 and is still ongoing. The Kiawah Bobcat GPS Research Project remains the longest, continuous GPS study on bobcats in the world. As of 2018, biologists have collared a total of 79 bobcats and obtained more than 100,000 individual GPS locations. Data from this study allows biologists to determine detailed habitat use patterns and to identify habitat areas that are of critical importance to bobcats. This plan provides suggestions and recommendations to all island entities regarding creation, preservation, and improvement of habitat to benefit bobcats. A rooster, in a separate and safe enclosure, is used to lure a bobcat into the trap. The bobcat is sedated and measured. A GPS collar is placed on the bobcat. Researchers locate each bobcat every few weeks and location date is downloaded. Kiawah Island is home to a healthy, stable population of bobcats.